John Carpenter’s 1988 film They Live is a credit to Left junk culture, a masterpiece of B movie science fiction. The surface story concerns John Nada, a homeless, unemployed drifter who lands in Los Angeles, falls in with a church-centered commune of other homeless people, and discovers that this community shelters a “terrorist group” committed to exposing an alien conspiracy to enslave humans to the ends of planetary exploitation and profit maximization for themselves and their sell-out human collaborators. Although Nada is nothing in a Reaganomically interpolated America, his bleak condition does nothing to weaken his embrace of the American Dream. But the movie is richer when we take “Nada” to mean “nothing” in a political philosophical sense, that is, as a mark of nihilism. Then John Nada becomes a champion of Nothing, and a critic of the very movie in which his character resides. Its narrative posits that perceptions of reality are the effects of a sociotechnical system, and that to see the Real, one needs to use an anti-technology technology, the Hoffman Lens. The better narrative turn, the more nihilistic move, would’ve been to describe those shades as another source of projection, another synthetic reality device, another Platonic Cave. Considering the movement’s flirtations with soft Nietzscheanism, it’s surprising that Afrofuturists haven’t yet zeroed in on the affinities of They Live. 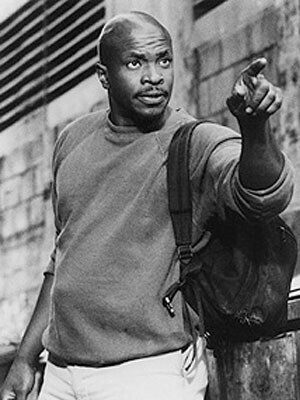 Particularly relevant is the character portrayed by the actor Keith David. The reciprocal interracial solidarity his character performs with Nada and others, his pugilistically surreal resistance to learning the terrorists’ lesson — “freedom hurts” — these attributes are less interesting than his name: “Frank Armitage.” It’s also the name of the person credited with writing the script. So, in (name) effect, the central Black character of the movie is foregrounded and raised to the level of creator. How’s that for Anti-Reaganism? Make, share, dream a better future. From the Center for Science and the Imagination at Arizona State University.